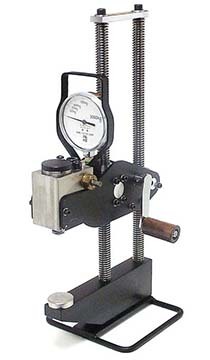 The Newage KB Series is a popular, manually-controlled Brinell hardness tester that meets ASTM E-110. This lightweight, portable tester is ideal for virtually any size or shape of metal specimen. Simply place the specimen between the anvil and test head; manually crank the test head downward onto the specimen; and apply the desired load using the hydraulic lever. Overload protection is standard. The tester applies up to 3000 kg load on a 10mm ball, making a visible indentation that is read using a Brinell scope or our B.O.S.S. system. The calibrated accuracy is better than 0.5% of the applied load. - Simple to use. Can be used on virtually any size or shape metal specimen. Meets ASTM E-110. - Repeatable operation. Manual operation locks the sample in position. Manual control the applied load up to 3000 kgf. - Economical. Ideal for virtually any Brinell application- low initial cost, low operational cost.